Trouble sleeping? Read an Annual Report. Neither the IRS nor any government agency require Annual Reports. Because few hard and fast rules dictate their contents, Annual Reports offer creative communicators some editorial freedom to share the stories that define your organization. The best Annual Report tell stories and lead readers on a multisensory, multimedia tour through your nonprofit. Professionally designed for print and online dissemination, these storytelling platforms favor photos, infographics and white space over charts and corporate doublespeak. This article includes links to Annual Reports (like the Cleveland Boys & Girls Club’s) that show some of these six steps in action. SPEAK, MEMORY— Of the cunning hero, The wanderer, blown off course time and again After he plundered Troy’s sacred heights. While you don’t need to write like Homer (nor, alas, is your Annual Report likely to rank among history’s great literature), your first sentence can spark readers’ curiosity and promise them a journey through a year in the life of your organization. Pledge that trip and guide them through it in the ensuing pages. Bonus: A concise first sentence helps you storyboard the rest of the report’s content. PRO TIP: If your CEO insists on a “Letter from the CEO”, suggest placing it later in the report, where real estate is more plentiful. “Your letter can be longer if we put it a little later in the report, boss!” is a compelling offer to a wordy leader. Three words to ban in your next Annual Report: “See Table #__”. Instead, use infographics, short quotes, and brief explanations to communicate the impact of donor dollars. Dropping numbers into a program like Infogram lets you format them in unique ways and supports the story you’re telling. Free programs (for basic functionality) like Infogram, Canva and Pixlr can supercharge the visual appeal of your numbers and other graphics. Complement your infographics with two-three sentence captions so readers understand how the numbers relate to the story you’re telling. PRO TIP: “Package” your most impactful infographics by offering readers more explanatory content online (Step Four). Mistakes were made when passive voice was used in your Annual Report. Passive voice kills active storytelling. The voice in which you write influences the tone of what you write. Too much passive voice makes your writing seem dull and listless. Active voice makes sentences shorter, clearer and more direct. PRO TIP: Don’t rely on grammar check features to save you from the perils of passive voice. Programs such as Microsoft Word don’t recognize all instances of passive voice. PRO TIP: Allocate some funds for a meticulous proofreader to review the final proposed draft. Make It Digitally Interactive & Accessible. Post interactive graphics online (Infogram’s upgraded platform makes this easy). If you have too much content and not enough physical pages (or if you just need to cut print costs), use your print version to direct readers online where they can engage with “the rest of the story” (a la Paul Harvey). With a little planning, you’ve already posted the extra content on your digital and social media. Girls Who Code offers a great example of an online-friendly and interactive Annual Report. Mouseover some of their graphics and you’ll journey deeper into the heart of their story. Given the vast percentage of people who access information via smartphone, you’d be wise to make your Annual Report mobile-friendly. That doesn’t mean “our Annual Report is available online via .pdf.” In the very least, format the copy and condense the graphics so they load quickly. 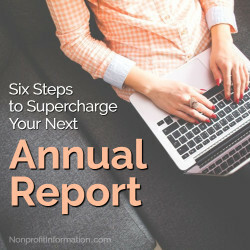 PRO TIP: Use your nonprofit’s digital and social media to “tease” the contents of your Annual Report in the days or weeks before you publish the print version. Use the contents of your Annual Report to fill in gaps in your social media and/or digital editorial calendars: Repurpose infographics, photos, quotes, and testimonials. Include links to the Annual Report. Highlight in your Annual Report a “storycap” or two that includes a link to a video where readers can discover the rest of the story. The storycap is just a photo and two or three sentences that pique readers’ curiosity. PRO TIP: Beta test this in your next e-newsletter. Include a storycap with a link to a longer (60-90 second) video. Track the CTR and views/likes of the video. Following these steps sets the stage for your grand finale: The Ask. Whether in print or online, your Annual Report must ask readers to continue investing in your organization. Don’t ask and you don’t get. With that in mind, your printed report should include a donation envelope or perforated postage paid pledge card. Your digital report should feature links to your organization’s donation page, social media, and e-newsletter subscription form. Without investing significant time, talent and treasure, applying some of the tips above can transform your next Annual Report from pillow to page-turner. Bruce Mendelsohn is Principal of The Hired Pen, an award winning communications, branding and messaging firm based in the Boston area, and Director of Content for ADC Partners. Specializing in digital storytelling, integrated marketing, content development, PR and social media, Mr. Mendelsohn has planned and managed multimillion dollar product and project launches, promoted brands including McGruff the Crime Dog, and researched and developed content for Congressional reports and testimony. A Top 100 Branding Expert to Follow on Twitter, Mr. Mendelsohn is a featured columnist at CommPRO.biz, MoneyInc.com, and has been quoted in the New York Times for his social media expertise.